Q:What do I need to know about Collar Clinic and purchasing a New dog training collar? Q:What do I need to know about purchasing a Reconditioned Remote Dog Trainer from Collar Clinic? Q:What kind of collar Trade-ins do you accept and how do I proceed? Q: What questions should I ask when selecting a training collar? Q:What Repair Services do you offer and how do I send in a Trainer for Repair? Q: What does it cost to have an e-collar repaired? What is included in the repair service? Q: How long can I expect my Training Collar to be in the shop for Repairs? Q: What if you cannot fix my Electronic Dog Training Collar? Q: Where do I find information on Troubleshooting my trainer? Q: How do I charge and maintain my trainer's Nickel-Cadmium (Ni-Cad) batteries? Q: How do I charge and maintain my trainer's Nickel Metal Hydride (Ni-MH) batteries? Q: What should I know if I plan to store my e-collar for a while? Q: Can my dog go swimming with the collar on? Q: Will the collar fit my dog? Q: How do I get a copy of the original Owners Manual? Q: What do I need to know about Collar Clinic and purchasing a new Dog Training collar? Collar Clinic is a Master Dealer for : Tri-Tronics, Garmin, D.T. Systems, Dogtra, E-collar Technologies, SportDog, DogWatch and PetSafe. We have specialized in electronic dog training collars since 1988, offering the best in electronic collars with a trade in option. We will almost always have what you need in stock and orders usually ship the same day they are received. Our customer service e-collar specialists are long term employees who love dogs and are knowledgeable about all our products. Every new trainer we sell has a 30 day money back guarantee. This will assure that you have purchased the correct trainer for your needs. A good dog is your objective, a satisfied dog trainer is ours. We can help guide you to the correct trainer for your needs, and give basic instructions on how to get started in your training. Below are excellent introductions to using a remote trainer for reinforcing commands and stopping unwanted behavior. Q: What do I need to know to purchase a Guaranteed Reconditioned Remote Trainer? Reconditioned Trainers include all of the necessary components needed for a complete system. Each model comes with all the accessories as when it was new. Also included is the manufacturer's owners manual which covers operation, care and maintenance. All reconditioned trainers have a 30 day money back guarantee. 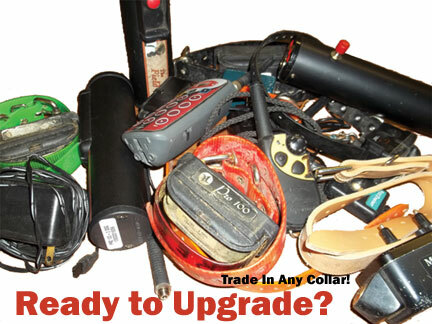 Collar Clinic backs every Reconditioned Trainer with a 6 month warranty on parts, labor and batteries. Our inventory of reconditioned trainers changes daily. All of the trainers listed in our print catalog may not be in stock at all times. Call toll free 1-800-430-2010 for Reconditioned Training Collars we may not be able to post on the website because of low supply. Accepting all Remote Trainers in Trade! Get the e-collar you really want! Q: What do I need to know to send an Electronic Dog Training Collar in for Trade? All remote electronic dog collars are Guaranteed Collar Clinic's Trade Allowance Credit of 10% off your purchase up to a maximum of $50.00. This discount cannot be combined with other trade-ins or any other special offers. Repairable Tri-Tronics, Dogtra, DT Systems and Garmin Astro models will have a greater trade value than the 10%. Our technicians will evaluate your system based on product model, serviceability and supply and demand. Our representatives will confirm with you the exact amount we can offer in trade value. This value will be equal to or greater than the guaranteed minimum credit of at least 10% off a purchase up to the maximum of $50.00. You will need to send us your trainer or remaining parts for this trade allowance credit to be applied to your purchase. If you decide not to trade, we offer repair services on Tri-Tronics, Dogtra and D.T. Systems or we will return the system to you at no charge. E-collars we do not service qualify for the gauranteed minimum trade credit of 10% off your purchase up to the maximum of $50.00. For maximum trade allowance, send all the components that came with your trainer. Please include a note with your name and daytime phone number requesting a trade evaluation. Call 800-430-2010 M-F 8:30-5pm ET or email tradein@collarclinic.com to get a fairly accurate quote on the Trade Value of your model. Trade Request Form to mail with your trainer. Q: What questions should I ask when selecting a dog training collar? How much range does the collar have? Range ratings are based on flat open terrain. Hills, Trees, Tall grasses, Buildings even the weather will effect your actual range. We suggest you select a collar with double the range that you feel you need. What type of adjustability for intensity selection does the collar or transmitter offer? What is the weight of the collar? Small breeds cannot wear some collars because of the weight. Review the training booklet below for proper use of an electronic training collar and proven methods to acheive successful results. Newer Tri-Tronics models (models with the intensity selection dial) are repaired within 3 business days from the time payment is received. It is best to send the payment with your trainer to prevent any delays in it's repair. We accept checks, money orders and the major credit cards. Older Tri-Tronics models (those that use the turn on plug) are repaired within 5 business days from the time payment is received. Repair Rates. Note: Shipping time is not included in these durations. Please allow 2-4 business days for UPS ground shipping or USPS Mail which is included in the repair fee. Q: What if you cannot fix my Electronic Dog Collar? If for some reason your Trainer is not serviceable, you will be contacted with component replacement or trade-in options. Collar Clinic has written a convenient Troubleshooting Guide. This guide is designed for Ni-Cad Battery operated systems. This Troubleshooting Guide has been written for your convenience to help you properly maintain your electronic dog training collar and keep your service expenditures at a minimum. 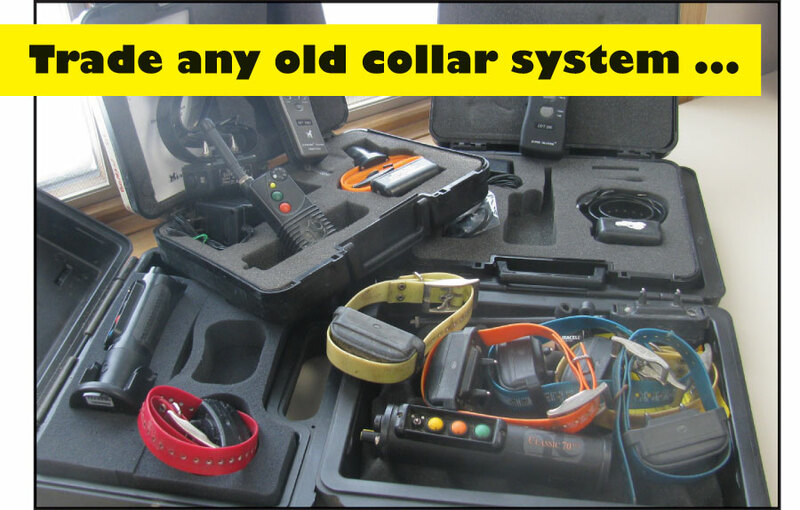 It does not replace proper servicing of collars in need of such attention nor does it replace information regarding the use and care of your trainer provided by the manufacturer's manual. This Guide lists the four most common problems users experience with their electronic dog training collars and what can be done to solve them. Also listed, you will find guidelines concerning proper charging and maintenance of your batteries. Proper care of your electronic dog training collar will give you maximum reliability and minimum down time. Should you experience any malfunctions, please review the troubleshooting guide before sending your trainer in for service. For further assistance, our customer service representatives are available to answer your questions Monday through Friday between 8:30am and 5pm ET. You can call us Toll Free at 1-800-430-2010. Problem #1: The collar lights the test light, but does not seem to affect the dog. Problem #2: The remote trainer has diminished or no range. Problem #3: The collar does not seem to hold a charge. Problem #4: The collar is dead, will not light test light. The shock intensity level is too low for the dog. Try increasing the level until desired response is achieved. The contact points are too short for the dog. Try using the longer contact points; if you are already using the longest contact points available for your collar, it may be necessary to trim some of the hair on the dog's neck. The metal part of the contact points must be touching the dog's skin or he will not feel the stimulation. The collar strap is not tight enough. The collar must be positioned on the smallest part of the dog's neck and tight enough for both contact points to touch the dog's skin. The transmitter signal may not be reaching the active collar unit. See problem #2, "no range." The collar may be working intermittently. There is an intermittent contact problem between the plug(s) and sockets on the active collar unit. Broken or badly worn plugs will not make reliable electrical contact and must be replaced for consistent operation (dirty plugs should be cleaned). The sockets on the collar unit must be kept clean of dirt, crud and corrosion for the same reason. A scrub brush with liquid soap under running water can be used to remove most of the dirt. To clean inside the sockets, a "Q-Tip" with the paper type stick (not plastic) and the cotton tip removed will get down inside the socket without damaging it. Be careful not to break it off while inserted. Use only rubbing alcohol as a cleaning solvent for plugs and sockets. Harsh chemicals may damage them. The remote trainer has diminished or no range. The transmitter and/or receiver antenna is physically damaged or is the incorrect antenna for your unit. Replace antenna with the correct type for your unit. The receiver antenna wire woven through the collar strap has been cut, broken or otherwise damaged. Replace the active collar strap. There is a metal structure, fence, building or vehicle between you and the dog. The radio waves are weakened by conductive materials in their path. For maximum range, operate remote trainer away from these objects. The flexible antenna on the collar has been taped or otherwise tied to the collar strap. For maximum range, the antenna should stick out freely away from the dog. In addition, the insert where the antenna screws in may be pulled out if the antenna is tied to the strap. The advertised range is for flat, open terrain. Trees, heavy brush, moisture, hills, etc. will all diminish your range capabilities. In addition, if there is another transmitter operating in the area, it may interrupt your signal. For maximum range, the transmitter should be held vertically, high above your head. Do not test collar with it sitting on the ground, it should be raised 2 feet, as when it is on a dog. When out in the field and having trouble reaching the dog, you may be in a "dead spot." Try moving 10 or 20 yards in any direction or moving to higher ground if possible. The collar does not seem to hold a charge. The batteries are not being charged properly or the charger being used is not functioning properly. Review the charging instructions in your owner's manual and the battery maintenance tips listed below. If you suspect the charger is defective, send it in, we will test it for you at no charge. There is an intermittent contact problem between the plug(s) and sockets on the active collar unit. Broken or badly worn plugs will not make reliable electrical contact and must be replaced for consistent operation (dirty plugs should be cleaned). The sockets on the collar unit must be kept clean of dirt, crud and corrosion for the same reason. A scrub brush with liquid soap under running water can be used to remove most of the dirt. To clean inside the sockets, a "Q-Tip" with the paper type stick (not plastic) and the cotton tip removed will get down inside the socket without damaging it. Be careful not to break it off while inserted. Use only rubbing alcohol as a cleaning solvent for plugs and sockets. Harsh chemicals may damage them. The 3-prong turn-on plug and/or the 2-prong variable intensity plug is not installed in the collar. The appropriate plug(s) must be installed for the collar to function. The batteries in the collar and/or transmitter need charging or the charger being used is not functioning properly. Review the charging instructions in your owner's manual and the battery maintenance tips below. If you suspect the charger is defective, send it in, we will test it for you at no charge. The plug(s) are not making good contact with the sockets in the collar. There is an intermittent contact problem between the plug(s) and sockets on the active collar unit. Broken or badly worn plugs will not make reliable electrical contact and must be replaced for consistent operation (dirty plugs should be cleaned). The sockets on the collar unit must be kept clean of dirt, crud and corrosion for the same reason. A scrub brush with liquid soap under running water can be used to remove most of the dirt. To clean inside the sockets, a "Q-Tip" with the paper type stick (not plastic) and the cotton tip removed will get down inside the socket without damaging it. Be careful not to break it off while inserted. Use only rubbing alcohol as a cleaning solvent for plugs and sockets. Harsh chemicals may damage them. The proper antenna is not installed in the transmitter and/or collar. The transmitter and receiver must have the correct antenna in order to function properly. In addition, if the transmitter is too close to the receiver, signal overload may occur which will result in no response from the collar. Separate transmitter several feet from collar when testing. Test light is not properly connected or is not functioning. The test lights with the rubber boots must be firmly seated on the contact points, also the highest intensity plug should be used for the brightest light when testing. Replace defective test light. The rechargeable Nickel-Cadmium batteries supplied with your unit should give you three to five years of service if charged and maintained properly. Following the guidelines outlined below will help you get the maximum life out of your batteries. The 3-prong turn-on plug must be removed from the collar when not in use. The receiver circuit will continue to drain the battery even though the collar is not being activated if the turn-on plug is left in the collar. Leaving the collar turned on for extended periods of time (more than 2 or 3 days) without charging will greatly reduce the life of your batteries. The variable intensity plugs do not affect the batteries or the charger. Always charge your batteries at room temperature. Do not store your unit where the temperature is below freezing or above 100 degrees Fahrenheit for extended periods of time. Undercharging or overcharging your batteries will also cause premature battery failure. Follow the charging instructions in the owner's manual provided with your trainer. If you do not have a copy of the owner's manual for your particular model, give us a call, we will send you a copy for a $3.00 shipping and handling fee. For During long term storage or periods of nonuse of greater than 3 months, the batteries should be charged for 10 to 12 hours every 3 or 4 months. With some chargers, your trainer can be left plugged into the charger continually during periods of nonuse. See your owner's manual. Charging & maintenance of your electronic training collar's Nickel Metal Hydride (NiMH) batteries. NiMH batteries do not develop a "memory", so it is not necessary or desirable to deplete your batteries between charges. You can expect approximately 40 hours of service between charges. This estimate will vary depending on your type of use. When to charge: You should fully charge the batteries of both the transmitter and receiver before you begin using a new trainer. Thereafter, charge the batteries whenever the LED(s) indicate that batteries are low. Once you see the low battery indicator come on, and depending on use, you should be able to train for another two hours before depleting the battery completely. How to charge: Plug the battery charger(s) into an ordinary household wall outlet. Remove the rubber protection cap from the charging jack on the device (transmitter or collar) to be charged, and plug the correct charger plug into the matching charging jack of the device to be charged. Always use the manufacturers charger. Using the wrong type of charger may damage the batteries. The components should remain on the charger for an uninterupted 12-14 hours. "On Charge" Indicator: The LED on the device you are charging will glow red steadily while the battery is being charged. "Full Charge" Indicator: The Tri-Tronics LED(s) indicate when the battery is fully charged. The collar LED will change from red to green or flicker between red and green.. The transmitter LED will change from glowing steadily to blinking red slowly (about once per second). Dogtra and D. T. Systems LED's does not change when the batteries are fully charged. You should remover both components from the charger after 12-14 hours. The charge does not switch to a trickle charge. It should take from 12-14 hours to fully charge batteries of both the transmitter and the collar. Remove the charger from the wall outlet when not in use. Batteries should be charged at room temperature. Don't charge at temperatures below freezing. Remember that it could take several hours for the batteries to come up to room temperature if the trainer has been outside in the cold. If you store your trainer for extended periods: If you do not use your trainer for extended periods, remember to keep the batteries charged up. Charge the batteries to full charge about every month. Replacing the Batteries: Tri-Tronics and Dogtra with the Ni-MH batteries are user-replaceable batteries. Batteries can be purchased. You do not need to send the unit in for this service. Open battery compartments only for the purpose of replacing a battery, and open them away from the field to avoid contamination. Do not open the trainer for any reason other than to replace the batteries. Only charge the new batteries when they are installed in the unit. Never attempt to charge a replacement battery when it is not installed in the collar or transmitter. Yes, all the collars that Collar Clinic carries are waterproof and safe for your dog to wear in the water. Q: What size is the collar strap? Most collar straps are 24-25" long and fit up to a 24" neck. Most straps can be shortened to fit smaller dogs. Electronic collars are worn at the smallest part of the neck, measure around the neck just behind your dogs ears. For small breeds some collars will be too heavy and bulky. We carry a wide selection of brands and styles. There is a collar to fit most any dog 10 lbs. and up.